Now that the hectic holiday season is past, we have time to pamper ourselves a bit. Time to read those books we haven't had time for, try some new recipes, and maybe even enjoy some luxurious herbal baths. Many times baths are a nice change from showers, but are still just a quick "wash-up". However, they can be a relaxing, therapeutic experience! In times past the herbal bath was held in great regard, and in many cultures the bath was so important that social institutions were built around it. Herbs used in these baths were chosen depending on the benefits derived from them. In Rome the bath waters were scented, but also disinfected, by tossing lavender into them. Catherine the Great had scouts traveling about in Europe and the Far East searching for herbs that would be beneficial skin tonics in her baths. Adding herbs to the bath can be done in a couple of ways. Simply prepare a strong infusion of the herbs of your choosing. Strain and add about 4 cups to the bath water. You can also place a handful of herbs into a muslin bag with a long drawstring. Tie the string to the water tap and let the water flow through the bag as you fill the tub. Let the bag steep in the water and do its job as you relax and enjoy. To get some extra benefits from the herbs, scrub a bit with the bag. As an added option when preparing your bath bags, mix an equal amount of oatmeal (not the quick kind) with the herbs. This will soften the water and soothe the skin.. Milk is also soothing to the skin. Mix some powdered milk with your herbs when making up the bags. Chamomile or calendula added to the milk will make skin especially soft. Other ways to enjoy the addition of herbs to the bath are using an herb vinegar, herbal oil, or bath salts. Herb vinegar is excellent for softening the skin and it helps get rid of dry flaky, itchy skin. Bath salts soften the water and can be therapeutic when made with bicarbonate of soda, which neutralizes the acids of the skin. Essential oils added to a carrier oil make a fragrant and relaxing bath. Some ideas for bath blends:Herbs for relaxationChamomile, calendula, comfrey, lavenderStimulating herbal bathsRosemary, peppermint, sweet marjoram, parsleySoothing bath herbsCalendula, comfrey, catnip, rose, yarrow Try some of the following recipes, or experiment and see what you like the most. You will feel like you are visiting a healing spa! Cover 1/2 cup of the mixture with 1 cup boiling water. Steep 20 minutes. Drain liquid into bath water. Tie herbs into a thin washcloth to use as an herbal scrub. This mixture will make 8 baths. Add 2 handfuls of your choice of herbs (individual or a combination) to 5 cups vinegar. Bring to a boil and let stand overnight. Strain and bottle. Add 1 capful to the bath. Refrigerate and use as desired. 4 parts Turkey Red Oil Note: Turkey Read Oil is a processed castor oil that will mix into the water rather than floating on top. 1 part essential oil (a single fragrance or a mixture) Add to the warm bath water to soften the skin as you bathe. Education and information has always been one of the cornerstones of our busy business since day one in March of 1968. Originally, founder and mom, Bertha Reppert did all of the classes and workshops but as we matured and our customers herbal knowledge grew it became time to bring in additional herbal experts. So now our schedule of events includes herbal enthusiasts from The Rosemary House staff and we enjoy bringing in guest speakers from around the country. 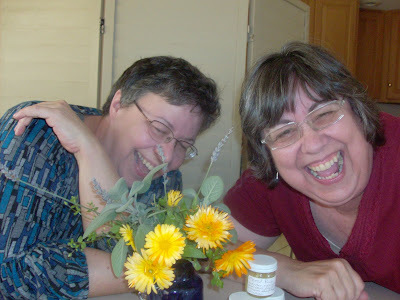 In 2007, our herbalist was the famed Rosemary Gladstar, author of The Family Herbal, we were thrilled to be able to get her “down off her Mountain” in Vermont to come to Mechanicsburg for a day long lecture on medicinal herbs. 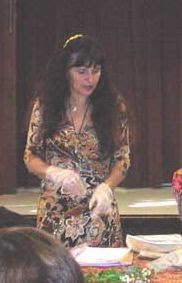 She presented two intensives, one on Chasing Away the Blues, Stress and Anxiety. Where she spoke on herbs for the nervous system.. Rosemary also provided an in depth handout on this subject and she cheerfully agreed to share a part of it with The Essential Herbal Readers. The Nervous System is our link to our environment. It has three basic functions: to receive, to interpret, and to respond. Within the limited paradigm of modern western science this involves only our physical being and the physical world in which we live. We have our five basic senses to experience our external environment and countless internal sensory neurons to monitor our internal environment. Then there are the some 12 billion cells that constitute our brain, the central computer. If that is all there is to the NS, it is enough to make it, far and away, the most important system of our body. It is what provides integration and coordination to our lives. It allows us to see, feel, touch, create, act and react. Without this basic physical NS there could be no life. To the degree that it is impaired, the quality, tone, color, and richness of life are diminished. If for no other reasons than these we must commit ourselves to keeping our NS healthy if we want a full life. Herbs and natural therapies play a vital role in the health and well‑being of the Nervous System. Not only are herbs full of concentrated nutrients that are important both nutritionally and medicinally to the nervous system, but herbs also form a direct link between the body, mind, spirit connection. It is important within the framework of the Nervous System, perhaps more so than with any other system of the body, to address health and lack thereof from more than just a treatment of physical symptoms. The following categories are helpful in defining the action of herbs on the Nervous System. Herbs that feed, tone, rehabilitate, and strengthen the NS are called Nerve Tonics. Nourish the nerve tissue; generally high in calcium, magnesium, B vitamins and protein. Though effective, most are mild in action and can be taken over a long period of time. Herbs from this category are included in every formula for Nervous System disorders. Examples: Oatstraw (Avena sativa), Skullcap (Scutellaria lateriflora), Wood Betony (Betonica officinalis), Chamomile (Anthemis nobilis and related species), Valerian (Valeriana officinalis), Hops (Humulus lupulus), Lemon Balm (Melissa officinalis), Kava Kava. Relax, help reduce pain, ease tension, aid in sleep. Do not deaden or block nerve endings. 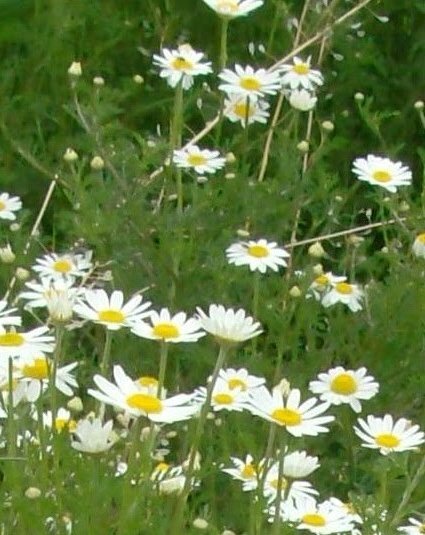 Examples: California Poppy (Eschscholzia california), Passion Flower (Passiflora incarnata), St. John_Wort (Hypericum perforatum), Catnip (Catnip cataria), Valerian (Valerian officinalis),, Hops (Humulus lupulus), Lobelia (Lobelia inflata),Lemon Balm (Melissa officinalis), Skullcap (Scutellaria lateriflora), Kava Kava, and Cramp Bark (Viburnum opulus). General action on the NS but are included in almost all nervine formulas for their soothing, healing qualities and nutritional concentration. Examples: Slippery Elm Bark, Oats, Barley, Flax Seed, Marshmallow Root. Mildly acting, herbal stimulants gently and nourishingly tone/activate the system. Often adaptogenic in action; feed entire system. Activate the nerve endings by increasing circulation, providing nutrients, increasing vitality. Examples: Peppermint, Gingko, Gota Kola, Spearmint, Wintergreen, Cayenne, Ginger, Bee Pollen, Eleococuccus, Ginseng, Spirulina, Rosemary, and Sage. The following wisdom came in an email from a friend several years ago, and was included in the May/June '05 issue of The Essential Herbal magazine. I'm a little pre-occupied with things here on the hill right now, so thought that these little gems could stand in for me until my own thoughts are a little clearer. *Your fences need to be horse-high, pig-tight and bull-strong. *Life ain't about how fast you run, or how high you climb, but how well you bounce. *Keep skunks and bankers and lawyers at a distance. *Life is simpler when you plow around the stump. *A bumble bee is considerably faster than a John Deere tractor. *Words that soak into your ears are whispered...not yelled. *Meanness don't jest happen overnight. *Forgive your enemies. It messes up their heads. *Do not corner something that you know is meaner than you. *You cannot unsay a cruel word. *Every path has a few puddles. * The easiest way to eat crow is while it's still warm, 'cause the colder it gets, the harder it is to swaller. * It don't take a genius to spot a goat in a flock of sheep. * The biggest troublemaker you'll probably ever have to deal with watches you shave his face in the mirror every mornin'. Leave the rest to Nature. With the arrival of February comes a relatively unknown holiday. February 2 is known in various cultures and religions as “Candlemas Day.” It is the Feast day of The Presentation of Jesus at the Temple. According to the Gospel of Luke, Joseph and Mary took baby Jesus to the temple in Jerusalem forty days after his birth, a typical custom of the time. It was here that the prophet Simeon predicated that Jesus would “become the light of the world.” In modern day, in some Roman Catholic churches, the priest blesses beeswax candles with holy water on Candlemas Day. These candles are then taken home and used throughout the year. Some people suspect that Candlemas Day was an attempt by the Romans to Christianize the Gaelic festival of Imbolc. Imbolc was celebrated at the same time of the year and is sometimes called St. Brigid’s Day. St. Brigid is, ironically, associated with scared flames and holy wells and springs. We also have Groundhog’s Day which was another evolution of Candlemas, also celebrated on the same day. Ancient cultures believed that upcoming weather could be predicted on this day. In addition to making crepes, I use Candlemas Day as a day to make my own beeswax candles and to take stock of all of my other candles, trim wicks, and clean candle holders. In the evening I try to use only candlelight. Life by the soft glow of candlelight is a much more enchanting place, not to mention the fact that mirrors are much more forgiving! On evenings such as these, I’m reminded of the little pleasures that get lost in the pursuit of modern convenience. On a more personal level, I always re-read my favorite novel of all time, The Secret Life of Bees by Sue Monk Kidd. It is a must read. The novel chronicles a young girl’s journey in the search for true motherhood, following her into the magical world of three sisters who not only keep bees and make honey, but who have created a world of nurturing ritual and worship. This of course brings us to honey, that sweet syrupy liquid-gold medicine and food of the Gods. Zeus, the Father of the Gods, is said to have been raised on honey and goat’s milk. Honey has been used for thousands of years, at least as far back as the ancient Egyptians. They used honey as part of the mummification process to embalm bodies. Prized by herbalists, honey has many medicinal properties including being antiseptic and antibacterial. It can be used topically to treat wounds and small cuts as well as internally for sore throats, coughs, and allergies. Because it is astringent and a natural moisturizer, honey can also be used as a natural cosmetic. Both Jeanne Rose and Rosemary Gladstar recommend using honey as a face mask or “honey pat.” According to Jeanne, the acid in the honey helps to get rid of blackheads and blemishes. First, make sure the face is completely dry (this is essential) and that the hair is pulled back away from the face. Gently cover the face with honey and pat it lightly. Rinse well with warm water. This facial will create a warm and lasting glow! Rosemary also talks about how her mentor, the great herbalist Juliette de Baricli Levy, grinds herb seeds into meal and mixes them with honey, then leaves them in the sun to dry. These “honey cakes” can be given as treats to little children. Herbal infused honeys are easily made by adding medicinal herbs such as ginseng, garlic, or ginger root to a jar of honey and letting it set for several weeks or months. To speed up the process, gently heat the honey and herbs several times, letting it cool between each heating. The herb itself can be removed from the honey and eaten as a delicious medicinal treat and the honey can be savored by the spoonful, used to sweeten a medicinal tea, or slathered on a piece of toast. The best honey to use, especially for the treatment of allergies, is probably local honey, but I also prize my honey that I got from Mayans living in the jungle in Mexico on my vacation this past summer. There are also other yummy “gourmet” sounding honeys that I’m longing to try such as avocado, blueberry, lavender, pumpkin blossom, and sage. In addition to producing honey, bees also leave behind tiny golden grains in their footprints, little gems known as bee pollen. 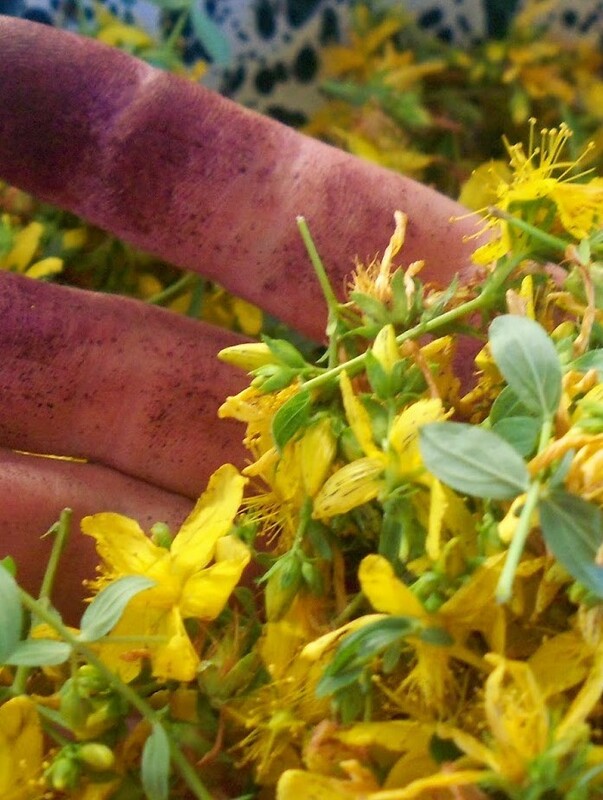 According to Rosemary Gladstar’s Family Herbal, bee pollen is a highly nutritious substance. It is a complete protein, contains all 22 amino acids, has higher concentrations of the 8 amino acids that are essential to human health, has high levels of 27 minerals, enzymes & coenzymes, vitamins B1, B2, and B6, niacin, panthenic acid, folic acid, vitamins A, C, & E. Bee pollen can be sprinkled on yogurts, cereals, or salads. Rosemary recommends it as one of the top “super foods” but also cautions us to use it in small amounts with respect, as it takes 4.8 billion grains of bee pollen to equal just one teaspoon. “Herb balls” are an ingenious creation developed by Rosemary that utilize three main by-products of bees: honey, bee pollen, and royal jelly. (Royal jelly basically baby bee food with many nutritional attributes similar to bee pollen). I learned how to make these delicious treats when I apprenticed with her in Vermont. She uses a base of nut butters (almond or cashew) and sesame paste mixed with honey and then adds super foods such as bee pollen and royal jelly, perhaps a few chocolate chips and a little coconut, and then whatever herbal powders you want, including kola nut powder for a chocolaty taste. Her “zoom balls” contain guarana for that extra rush, her throat coat balls contain soothing herbs for sore throats, there are herbal balls with gingko for aging, even aphrodisiac herb balls. Use your imagination and the possibilities are endless! They are truly so delicious that it is hard to believe they are medicine and not dessert. Warning: Honey is a natural, healthy food that most bacteria cannot grow in. However, it can carry a mild form of botulism and therefore should not be given to babies under the age of one year old because their immune systems are not yet fully developed and they may not be able to fight off this bacteria. Bee Pollen and Royal Jelly can sometimes cause allergy and asthma symptoms. Use with caution in small amounts until you know how your body will react. Making beads from plant materials is fun and very rewarding. There are several methods, and the following is one of the time-honored traditions amongst herbies. I think most people try this one at least once and the beads that result are really special. Remove the white stem ends from the rose petals. Cover the petals and leaves with plain water in a nonmetallic pan (editor’s note: some sources suggest using cast iron. We did, and the beads were lovely). Simmer, covered, for 30 minutes. Ensure that the mixture doesn’t actually boil. Turn off the heat and let soak until the next day. Repeat the simmering again for a half hour. Repeat this for three days in all, adding rose water when necessary (particularly using rose water instead of plain water on the last day). On the last day squeeze out all liquid until you have a fragrant mess. The mixture should be dry enough to hold its shape. Form into small, round beads with your hands, each about 1/4 inch long. Push a large needle or stiff wire through each bead while it’s still wet to form holes for stringing. Let dry for a week or so, moving them around to ensure even drying. 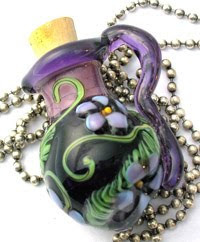 The beads will be black when finished, and when worn on the body they release a delicious rose scent. The fragrance can be refreshed by rubbing a tiny amount of rose oil into the beads. Rose beads have been made and handed down through generations. If you're more inclined to want a simpler version, try our pre-mixed botanical bead mixes, or learn to do them with our book on herb beads. 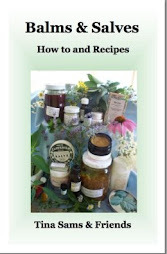 Either way, it's a wonderful project for a day immersed in herbs! It seems odd to think that the time just following the holidays can be difficult, but there's that let-down, along with the fact that it's a long way off until the next time people get some time off work. We won't even talk about how long we in the North East have to wait to plant our gardens! 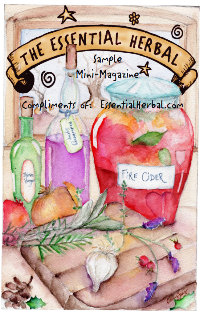 There are many herbs that can help ease and calm a stormy day, or even a long period of difficulty. In fact, in thinking about writing about these herbs, I looked back over an article that I wrote for a small publication over 10 years ago. In addition to the herbs that were at that time cutting-edge, there are several more that hadn't come to the forefront yet. 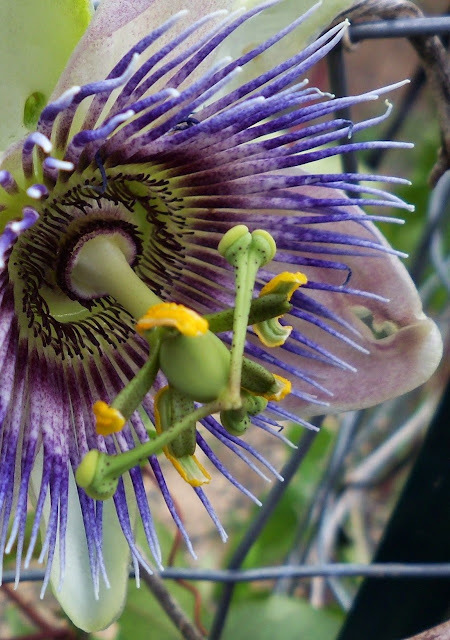 Just the other day, Dr. Oz talked about Passionflower, and how it can be helpful - particularly for women who are constantly going from one task to the next, never finishing, and then having trouble shutting down for a restful night - know anyone like that? We will start with mild and go from there, listing a few herbs that can help right now. 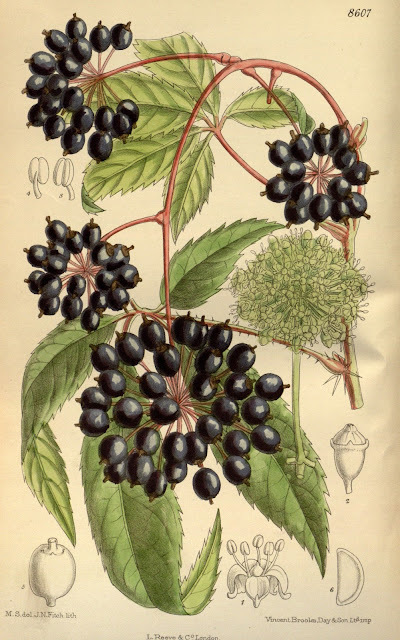 One would additionally be sure to get lots of rest, see that their vitamin and mineral requirements were met, and look into some deeply nourishing herbs for the nervous system, as well. Many of these are said to take days or weeks to make a difference, but I can always feel a shift right away. My first line of defense is always Chamomile. I like to drink a cup of tea and that will usually help. It immediately helps me to drop the shoulders and let out a long breath. Another possibility is 20 or 25 drops of tincture, because often if you had time to sit and drink a cup of tea, you wouldn't be stressed, right? If at all possible, a nice warm bath with a few drops (no more than 10) of Lavender essential oil OR a spray of essential oil mist on the pillow case before bed will help to put a bad day behind and let a new day get a decent start. 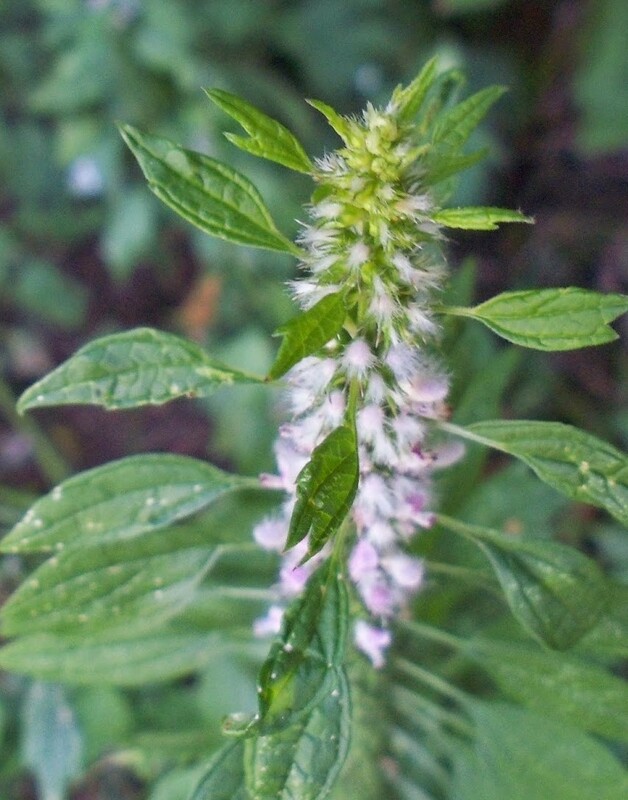 Motherwort (Leonurus cardiaca) tincture is a favorite for one of my friends. She uses it when her kids "get on her last nerve", and suspects that's how the herb got it's name. This herb is well known for her helpfulness in menopause, but part of that is the way it helps with anxiety and ... stress! Next in line is a St. John's Wort. It is made it into a tincture here each year and taken only as needed. Some people take it daily, although it should not be taken in conjunction with any prescribed MAOI inhibitors. We also keep Eleuthero (aka Siberian Ginseng) on hand. Eleuthero was tested in large block factories in Siberia. The workers in one building took the herb daily, while the next building did not. The workers using the herb were found to do better in every measurable way - absenteeism, quality of work, cheerfulness, etc. Scientists are unsure exactly how it works, but it is stimulates cells of the immune system and protects the nervous system. Some people feel that the two (SJW and Eleuthero) work very well together. Of late, these remedies weren't cutting the mustard for me. Coincidentally, a few years ago I was looking for something for a friend who is a tax preparer. Four months out of the year the workload increases by (seriously) 1000% and the stress takes a visible toll. A couple new herbs became part of my daily routine. 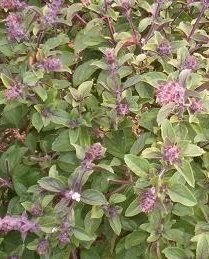 Holy Basil (Ocimum sanctum) - also known as Tulsi - came up in my research with some prodding by Sandi Wakefield at Black Kat Herbs. That year it so happened that I had purchased a Tulsi plant at an herb festival, and she was large and busy, perfect for a quart or so of tincture. He and I shared it, and it was the first time in many years that I heard him laugh in March. Seriously. We sometimes use it in tea form, too. Besides helping with stress, Holy Basil is considered a tonic to the nerves, increases memory, is anti-inflammatory, anti-viral, anti-oxidant, immune stimulating, and acids contained in the herb change the way our bodies release cortisol and the way we react physically to stress. In India, Holy Basil is used for nearly all ills. I have an entire flat on order for this spring! 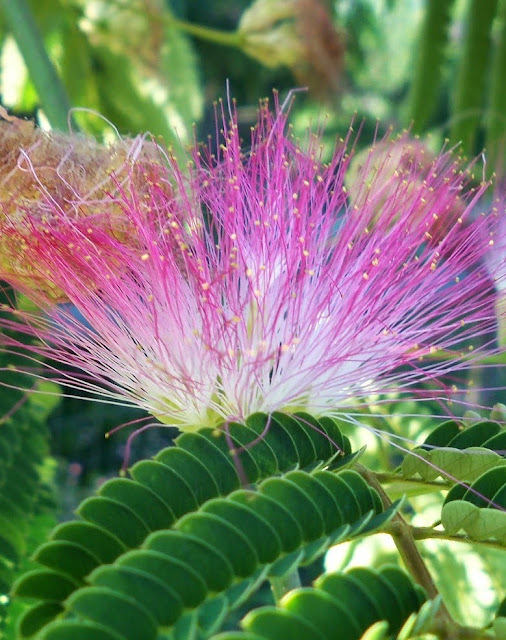 In addition, we use Mimosa (Albizzia julibrissin), also sometimes known as "the happiness herb." It is also sometimes called "herbal Prozac", which I don't like at all, but it seems to get the point across, and some herbalists include it in formulas for grief. Sometimes when we are stressed it is because we are grieving the loss of something. 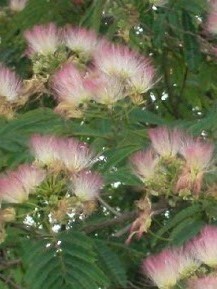 If you've ever seen Mimosa flowers, they are happy little flowers, pink puffs that sit on top of the leaves in bunches. Mimosa helps to reduce anxiety and stress. The flowers are thought to increase happiness while the bark is more grounding. We use a combination here at home. I use it daily, and when my 18 year old starts getting weepy or angry during certain parts of her cycle, I will offer her a bit of the blend. Those are the things we use here at The Essential Herbal. Almost all of them are available on our website if you don't have them growing at your house! 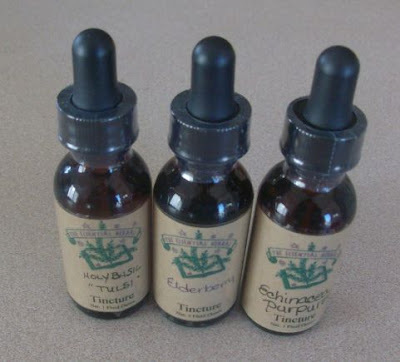 Three wonderful tinctures to keep you and yours happy and healthy through the dark days leading to spring. Holy Basil, Elderberry, and Echinacea - one ounce of each. There are a lot of different kinds of herbalists out there. Some people weigh and measure everything, following precise recipes. Some work by the fullness of the moon. Some of us learned at our granny's knee, and some take a lifetime of classes. Some worked for years and years, finding kindred spirits to share information and knowledge with. Some wouldn't dream of making anything without adding a little energy from the universe. Me - I'm a folk herbalist. I believe that the herbs are brilliant, and they will do what they were meant to do if you can get them where they are supposed to go. To me, measurements are handfuls and bunches and "some" - just the way I cook. The thing is, I also think that everyone is correct. I respect that not everyone will be comfortable with the same thing that feels right to me, because I know and love far too many people who would never attempt to cook without a recipe. In a recent conversation, it was emphatically intimated that the methods I use disrespect plants and the medicine that comes from them. 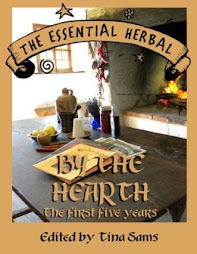 If I didn't know so many wonderful herbalists who are also folkies, it would have cut me to the quick. In a lot of ways, herbs are like a religion or a belief system. There will always be people who see their way as the only way. That is just human nature. In high school, I took a class called World Cultures. In that class, we studied all of the major religions, and in retrospect, the teacher did a fine job of keeping his own beliefs to himself. He simply stated the tenets of each system, how the people lived their lives, and the beauty of each of those ways of life and beliefs. So these days, my personal mission is to get people involved with the plants around them and learn to bring them into their lives... to share that joy of discovering how good nettles taste, or how deeply satisfying it is to be able to soothe a loved one who is ailing with a handful of weeds from the yard. Anyone who knows me will also know that I have a deep love and respect for those plants. I don't really care how you learn, or how you eventually use the plants - anymore than I care how you pray. I only care that you do learn, and that your methods bring you joy. 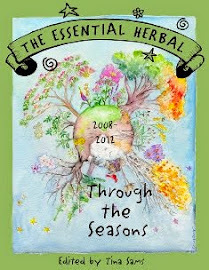 Whew - the holidays are over here at The Essential Herbal, and it's time to get back to the normal day-to-day stuff. There are the little details to be done, like figuring out tax stuff, but I don't want to think about that just yet. Tomorrow's another day. And besides, there's a new deadline coming up. It seems like that happens all the time! I've been just moving from one lounging position to another for the last couple of days. Not much energy, no motivation - blah. Several (like 10!) 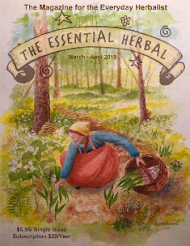 of my friends and listbuds are just getting their coursework or ordering the Art and Sciences of Herbalism course from Rosemary Gladstar, and I'm a little jealous. There are a couple of things going on behind the scenes here that have to work themselves out over the next few weeks, so we'll just see. I wanna play too! Two of my friends started talking about it on the TEH list, and within 24 hours there were a whole bunch of people signing up - AWESOME!!! Last night, my friend Leslie posted about infusing some white sage in oil. She said that it just made her feel more balanced and motivated. I've had a pound of the wonderfully fragrant stuff sitting here, waiting for me to get up the gumption to distill it. So I followed her example and infused a little bit into olive oil. She was right - it is amazing. Next up was going outside to gather some chickweed for an oil infusion. A friend of mine ran out of it and needs it for some products she makes. Even in this bitter cold weather, the chickweed is green and lush under the pines - even if it is frosted. The wind was whipping around pretty well, and every so often flipped my coat up over my head when I bent down under a tree. Ha Ha, very funny, Mother Nature. 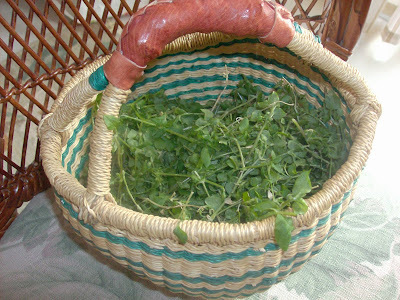 It was fast work to fill a basket, as the mats of chickweed clung together in the cold. It is now in a crock covered with oil in the warm oven, infusing away. Last, I was going through the pictures on the disk when looking for the chickweed shot. I found this one of my sister and me when we were taking pics for the upcoming dvd on salves and balms. "She" had chosen a much more serious shot - so for posterity, here we are doing what we do more than anything else: Happy New Year, everyone. Tomorrow I'll post to let you know what we'll be awarding at the end of the month when we draw from all the orders rec'd in January!